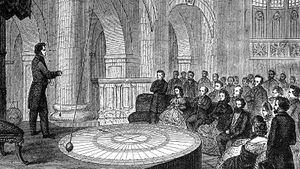 The Foucault Pendulum is a famous experiment which is alleged to give simple, direct evidence of the earth's rotation. Introduced in the 1851, Léon Foucault claimed that the swinging rotational motions were proof the earth's rotation. The pendulum swings back and forth, and over time, slowly seems to rotate over its arena or "pit". It is explained that the earth is rotating beneath the pendulum. Today Foucault Pendulums are popular displays in science museums and universities. In the unmotorized Foucault Pendulum experiment the pendulum is, as we will read below, generally inconsistent in its movements. Because of air resistance and the impossibility of perpetual motion, the unmotorized pendulum will only move for a short while before needing to be reset. In motorized Foucault Pendulums, as seen in museum exhibits, it is the repetitive machinery which imparts the repeating lateral bias that creates the regular results seen for the museum's visitors. Thus, the experiment is entirely invalid as a demonstration of diurnal rotation. That a pendulum on a line can rotate as it swings back and fourth has more to do with the initial conditions which set it into motion than the supposed rotation of the earth. by Michael F. Conlin, Ph.D.
“ In private correspondence, Airy had repeatedly dismissed the Foucault pendulum experiment as a "fraud." He regarded the latitude-dependent formula for the period of the apparent precession of the pendulum as a "mathematical curiosity having no application whatever to the soi-disant experiment." Attending no demonstrations, Airy based his conclusion on oral accounts of the experiment. Concurring with Airy, Powell accepted the theory but held that as a "practical question" the experiment was "doubtless open to every kind of doubt." After learning of successful demonstrations by British scientists, Airy conducted his own experiments. Although it was possible to conduct the experiment properly, he concluded that the "difficulty of starting a free pendulum, so as to make it vibrate at first in a plane, is extremely great." The work goes on at length on the public controversy surrounding the experiment. “ First, when a pendulum, constructed according to the plan of M. Foucault, is allowed to vibrate, its plane of vibration is often variable – not always. The variation when it does occur, is not uniform – is not always the same in the same place; nor always the same either in its rate or velocity, or in its direction. It cannot therefore be taken as evidence; for that which is inconstant cannot be used in favor of or against any given proposition. It therefore is not evidence and proves nothing! Secondly, if the plane of vibration is observed to change, where is the connection between such change and the supposed motion of the Earth? What principle of reasoning guides the experimenter to the conclusion that it is the Earth which moves underneath the pendulum, and not the pendulum which moves over the Earth? What logical right or necessity forces one conclusion in preference to the other? “ We believe, with all due deference to the pendulum, and its proprietor, that it proves nothing but the craftiness of the inventor; and we can only describe the show and showman as deceptions. A thing so childish as this ‘pendulum proof’ that it can only be described as one of the most simple and ridiculous attempts to gull the public that has ever been conceived. …It has been said that the pendulum experiment proves the rotation of the earth, but this is quite impossible, for one pendulum turns one way; and sometimes, another pendulum turns in the opposite direction. Now we ask does the earth rotate in opposite directions at different places at one and the same time? We should like to know. Perhaps the experimenters will kindly enlighten us on this point. We are instructed to spend several days adjusting the alignment of the photo beams, which affects the pendulum's precession, an element which is supposedly a function of the earth's rotation, until we have determined that the "precession is operating properly". In 2001 a Foucault pendulum device was installed at the "South Pole" in the stairwell of a newly constructed research station. It has been claimed that this verified Foucault’s theory. However, excerpts from the report show that adjustments had to be made to obtain the desired results. “ There was no mechanism for keeping the pendulum swinging and the amplitude decayed within a couple of hours so it had to be restarted periodically over the 24 hour period. ...Our first attempt with the pendulum showed the Earth spinning backward from what was expected. We didn’t notice this at first because we’re all from the Northern Hemisphere and are accustomed to the earth spinning in an anticlockwise direction. We then realized that from our frame of reference the earth should be spinning clockwise so we had to modify the pendulum. ...Our second attempt showed the earth rotating in the proper direction but at an angular velocity twice what is expected (ire., 12 hour days instead of 24). We suspected some kind of government conspiracy but decided to make a further modification and try it again. One alternative explanation that has been suggested by those who do accept the Foucault Pendulum is Mach's Principle. Mach's Principle explains that if the earth was still and the all the stars went around the Earth then the gravitational pull of the stars would pull the pendulum. As Mach said "The universe is not twice given, with an earth at rest and an earth in motion; but only once, with its relative motions alone determinable. It is accordingly, not permitted us to say how things would be if the earth did not rotate."